Olives Restaurant at the Kempinski Hotel Barbaros Bay in Bodrum, Turkey has it all: a gorgeous dining room, a breathtaking view of the Aegean Sea, and a fabulous chef. The colors sage green, olive, and gold set the stage for Olives Restaurant at the Kempinski Hotel Barbaros Bay. Lush banquettes luxuriously adorned with pillows capture the essence of Turkey with rich colors and textures, the geometric inspired chairs covered with sage green and gold fabric reflect the contemporary elegance evidenced throughout the hotel, and there is an inspired bit of whimsy in the cobalt blue and bottle green disk chandelier. Although the hotel will celebrate its' grand-opening on May 19, 2006, Edward F. Nesta and I stayed at the hotel in March 2006, and were most impressed with the hotel, restaurant and the Six Senses Spa. We began our dinner with a first course of Basil Cream Soup with sautéed Prawns (Kremali Fesleğen Çorbasi Sote Karides ile), a rich creamy soup with a decadent topping of sautéed shrimp and the Mediterranean Fish Carpaccio (Balik Carpaccio), which was thinly sliced marinated raw fish served with Crete beans and a fresh coriander pesto sauce. Since we enjoy sampling native wines when we travel, we paired our selections with local Turkish wine, a 2004 Angora Kavaklidere made with Cabernet Sauvignon, Cinsault and Gamay grapes, which was a young wine with a light nose, a hint of pepper and soft tannins on the palate with a medium finish, and a 2004 Angora Kavaklidere made with Sultaniyi grapes, which had a light honeysuckle nose, had grapefruit and green apple on the palate, and was a crisp and pleasantly enjoyable wine. For our second course, Edward selected the Grilled Lamb Chops à la Provencal (Izgara Kuzu Pirzola à la Provencal), lamb chops that were marinated with tomatoes, garlic and rosemary and served with baby vegetables and olive mashed potatoes, and I selected the Fettuccini with Cheese and Walnuts (Fettuccini Peynir ve Ceviz ile). The following night, we returned to the restaurant, and began with traditional Turkish meze, which consisted of hummus, pureed eggplant, dolmas, white cheese, olives, crispy fried dough filled with lamb, and other delicious enticements. Our waiters Hakan and Mehmet recommended the fresh Dorado and Sea Bass for our second course, which we paired with a 2003 Serafina Chardonnay made in Turkey. Both fish dishes were served with boiled potatoes, yellow and red cherry tomatoes, and a thin cucumber slice wrapped around a mixed green salad. For dessert, we sampled delicious authentic Turkish Firin Sütlaç accompanied with pistachio ice cream. 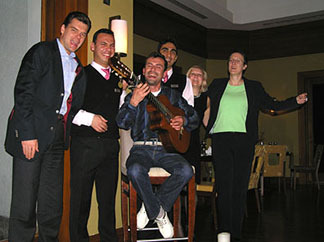 When guitarist, Volcano Gureltol came by to serenade us, Hakan and Mehmet decided to join him. I didn't want to miss the singing and joined them, and soon the General Manager Michael Sorgenfrey and the hotel staff also started singing and it was a very enjoyable evening. On our last evening at the hotel, Executive Chef Eyüp Yunusoglu was trying out recipes for their new Bar Blue menu, and Mr. Sorgenfrey invited us to join his tasting party. We began the evening with a fresh fruit juice and vodka cocktail while we waited for the sampling to begin. Chef Eyüp had prepared a wide selection of recipes for the tasting party, and began the tasting with a Salmon Cake with Red Pepper Sauce, followed by a Turkish Salad with Crostini, Crispy Coconut Battered Prawns with a Sweet and Sour Sauce, Brasciola on Vegetables, Mozzarella and Eggplant with a Salad with Artichokes, Salmon and Smoked Eggplant. The tasting continued with Artichoke, Mushroom and Meat Risotto, Breaded Lamb Chops, Tuna with Crispy Salad and Pomegranate Sauce, and the tasting still continued. It was interesting being part of the selection process and helping to decide which items would make it on the menu, and what items would be reworked or simply forgotten. Tasting was never more complicated or enjoyable, especially when paired with very nice Turkish wines! Somehow our waiters Hakan and Mehmet found out that it was my birthday, and they magically appeared with a gorgeous chocolate ganache birthday cake, as Volcano sang Happy Birthday. It was a delicious way to end a most memorable stay at the Kempinski Hotel Barbaros Bay. Read our articles on Bodrum and Turkey in the Destinations, Hotels and Resorts, Chefs' Recipes, Restaurants, Spas and Luxury Products sections.